Linisort V series systems use a vertical loop that derives maximum benefit from Linisort technology while allowing it to be installed in smaller spaces. 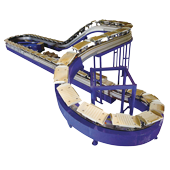 The Linisort VS is an automatic sorting machine designed to handle articles of up to 5kg. Daily necessities and miscellaneous goods, food, apparel, mail, cosmetics, drugs, toys and games, etc. By modifying the Linisort VS to incorporate a horizontal curve, the Tsubaki Linisort VSH can be installed near a wall, or in a corner. Based on the popular Linisort series, the Tsubaki Linisort 3DR can be assembled in a variety of formats, incorporating a three dimensional loop. 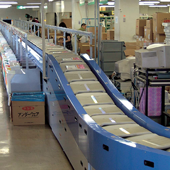 Distribution centers, Newspaper printing factories, newspaper insert centers, etc. 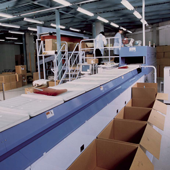 Cases, fold containers, newspapers, inserts, mail, and rice bags, etc.